I had nothing better to do than to wait. So I sat and watches the informal customs office deal with the passengers who came off the cruise ship. My nerves told me not to take the shot, but I did it anyway and suffered no consequences for it. This was taken at Loreto, Mexico, which was selected as an alternative port after Matzlatan was the scene of a massacre engineered by the drug cartel. 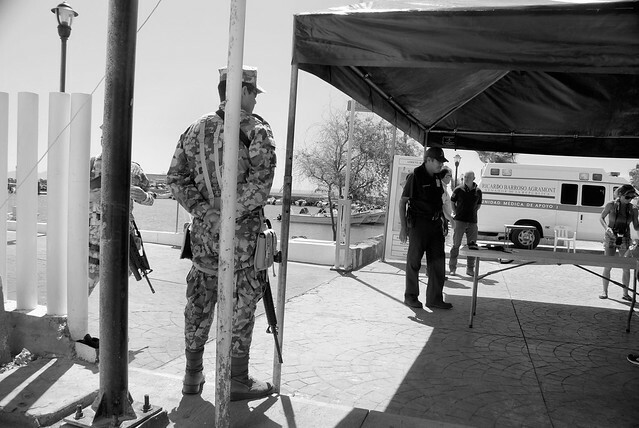 Posted in Mexico, Nikon D60 Tagged black and white, bureaucrats, customs, digital, soldiers.